Internal fixation of scaphoid can be done either percutaneously or using open reduction. In modern orthopedic practice, percutaneous fixation of the scaphoid is preferred where feasible because it is minimally invasive and there is no need for wide dissection and tissue injury caused by surgical dissection. The fracture pattern should be clear. Conventional radiographs may not adequately demonstrate the complete fracture configuration. A CT scan is strongly desirable if a percutaneous procedure is planned. Read more about the anatomy of the scaphoid. As 80% of the surface of the scaphoid is covered with articular cartilage and the scaphoid bone itself is curved, it makes it difficult to choose entry points for fixation and not many options are available. Herbert screw or headless screw is the screw used for scaphoid fixation in both percutaneous fixation and open reduction and internal fixation. Percutaneous fixation is largely indicated for undisplaced or minimally displaced fractures of the waist of the scaphoid. Before starting the surgical procedure, examine the fracture pattern under the image intensifier. Be sure that the fracture is suitable for percutaneous technique, and that no secondary displacement has occurred. The patient is placed supine and wrist is hyperextended on a bolster or rolled towel. Hyperextension and ulnar deviation facilitates the fracture reduction and also assists in bringing the trapezium dorsal to the insertion point of the guide wire, it being at the scaphoid tubercle. Place a rolled towel or bolster under the wrist and hyperextend it. It may be helpful to mark on the skin the position of the scaphoid, the palmar rim of the distal radius, and the level of the scaphotrapezial joint. A stab incision of 5 -10 mm is made distal to the scaphotrapezial joint. Deepen through the subcutaneous tissues by blunt dissection. Then incise the capsule of the scaphotrapezial joint. The distal pole of the scaphoid is now accessible for insertion of a K-wire. Use a hypodermic needle to determine the insertion point radiologically before inserting the threaded guide wire. The insertion point is on the distal surface of the scaphoid tubercle, at the edge of the scaphotrapezial joint. Using a drill guide or protective sleeve, a threaded guide wire is inserted at the confirmed entry point directed angled 45 degrees dorsally, and 45 degrees medially, along with the mid-axis of the scaphoid. The position of the wire should be as perpendicular as possible to the fracture line but it may not be possible in oblique fractures. Entry is from the distal point and should not pierce the proximal cortex of the scaphoid. Using a dedicated measuring device over the guide wire, through the drill guide. This is the preferred method. Take another guide wire of the same length and place its tip onto the bone at the insertion point. The difference in length between the protruding ends of the two wires indicates the length. Subtract 2 mm to determine the screw length. Using a power drill preferably with slow rotation. [Exerts a more controlled force on the fragments, thus reducing the risk of displacement than manual drilling] while checking the position of the tip of the drill bit using image intensification. Use of self-tapping screws would eliminate the need for tapping, which may be carried if non-tapping screws are used. The screw is inserted over the guide wire. The threaded section of the tip of the screw passes completely beyond the fracture plane to achieve interfragmentary compression. Guidewire should be removed before tightening the screw. The screw threads should be fully buried in the bone at the insertion site. The position of the screw should be confirmed on all views using image intensification and stability of the wrist should be checked. Open Reduction and Internal Fixation of scaphoid fractures is considered in fractures which are not geometrically suitable for surgery and for perilunate equivalent injuries. In latter case, acute ligament repair is also recommended because late carpal instability invariably occurs with closed treatment. As an urgent treatment, the carpus should be reduced as soon as possible by extending the wrist to reduce the capitate into the lunate fossa. Open reduction is also used in fracture no-union. If the scaphoid has minimal comminution, this injury can be treated with a palmar Russe approach for screw fixation of the scaphoid and percutaneous pin fixation of the lunotriquetral joint. Dorsal approach is chosen in these cases as it provides the necessary exposure to realign the scaphoid and repair the lunotriquetral interosseous ligament. Palmar approach is favored for waist fractures because it protects the major vascular supply to the scaphoid. A standard Russe incision along the course of the flexor carpi radialis and extended distally along the border of the glabrous skin of the thenar eminence. Splitting the sheath of the FCR allows it to be retracted ulnarly to protect the palmar cutaneous branch of the median nerve. 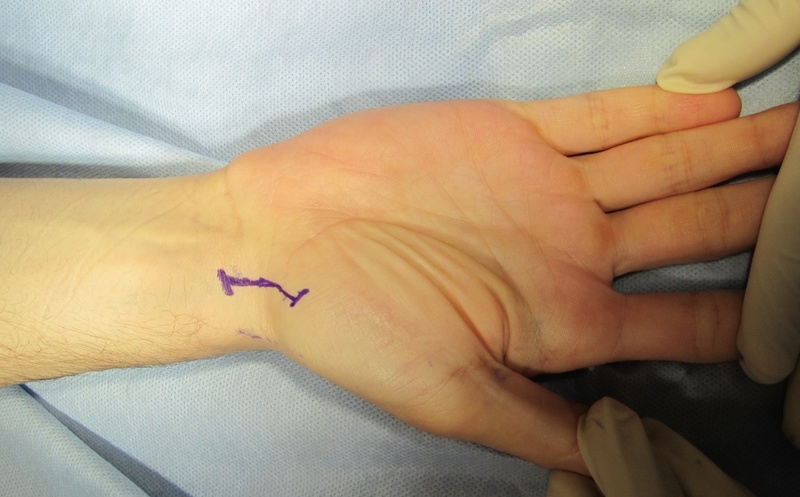 The floor of the FCR sheath is incised longitudinally to the scaphoid, try and preserve as much radioscaphocapitate (RSC) ligament as possible because this helps to contain the proximal pole and prevent it from subluxating palmarly. Bone grafts are used to wedge open collapsed scaphoid fractures to correct their alignment. These grafts may be taken from the iliac crest or the distal radius. The inner wall of the dorsal scaphoid cortex can be notched with a small osteotome to accommodate the wedge graft. However, the dorsal cortex of the scaphoid should be preserved as that can detach the blood supply and make the fracture highly unstable. Screw fixation of the scaphoid is done using the same principles as outlined above. Confirm the screw in the image intensifier. Repair palmar capsule and other layers of the wound. Dorsal approach is indicated in comminuted scaphoid fractures and to repair the lunotriquetral interosseous ligament. It is important to preserve the blood supply entering with the cuff of tissue on the dorsal surface of the scaphoid just distal to the articular surface. The dorsal approach provides better exposure for bone grafting and allows for more accurate placement of implants in small proximal-pole fractures. Make a straight dorsal skin incision starting over Lister’s tubercle .and extending for about 4 cm distally. Lister’s tubercle or the dorsal tubercle of the radius is a bony protuberance on the dorsal surface of the distal radius. It separates the 2nd (ECRB and ECRL) and 3rd (extensor pollicis longus) extensor compartments. It acts as a pulley for the EPL tendon, changing its mechanical direction of action. In the radial skin flap and supplies the lateral part of hand and digits, Identify and preserve the dorsal superficial branch of the radial nerve. Incise the extensor retinaculum over the extensor pollicis longus (EPL) tendon and open the distal part of the third extensor compartment. The EPL tendon is then retracted radially together with the tendons of the second extensor compartment (extensor carpi radialis brevis and longus). Open the capsule by a longitudinal, or inverted T-shaped, incision, starting at the dorsal rim of the distal radius, extending to the dorsal intercarpal ligament. Flexion of the wrist aids in the exposure of scaphoid, especially proximal pole. Carry out the fixation as outlined before. Ligament repair is carried after the scaphoid is stabilized. This may include scapholunate and/or lunotriquetral ligament. The limb is splinted. Two weeks after surgery, the splint and sutures are removed and a short cast is applied for 1 month, at which time the cast is discontinued and a removable splint is used until the x-rays confirm union. After that patient is put on rehabilitation protocol.